In a back-and-forth battle between 2018 NCAA Tournament teams, two-time defending Missouri Valley Conference champion Drake made the plays down the stretch to steal an 83-77 win over the Nebraska women’s basketball team on Wednesday night at Pinnacle Bank Arena. In a game that featured huge runs by both teams in the first half, the game settled into a classic possession-for-possession battle in the final 15 minutes. The Huskers (0-1) used a 14-0 run to start the game to build a 16-point first-quarter, before Drake responded with a 16-0 second-quarter run on its way to building a 13-point edge two minutes into the second half. The Huskers completely wiped out Drake’s double-digit lead with five minutes left in the game, as freshman Sam Haiby scored four straight points to give Nebraska a 67-65 lead. But that margin was short-lived and the experienced Bulldogs, who feature 11 combined seniors and juniors on their roster, made enough plays down the stretch to open their season with a road win. Haiby, a 5-9 guard from Moorhead, Minn., led Nebraska with 13 points off the bench, while juniors Hannah Whitish and Nicea Eliely each added double figures with 10 points. Sophomore Taylor Kissinger and freshman Ashtyn Veerbeek both pitched in eight points, while graduate transfer Kristian Hudson contributed seven points and three assists off the bench. Freshmen Leigha Brown and Kayla Mershon each managed six points off the bench, as Nebraska’s five newcomers combined for 40 of NU’s 77 points on the night. As a team, Nebraska hit 40.9 percent (27-66) of its shots from the field, including 10-of-28 three-pointers (.357). The Huskers also knocked down 13-of-17 free throws (.765). But the Big Red was out-rebounded 44-40 by the Bulldogs, who also won the turnover battle, 20-17. Drake converted Nebraska’s turnovers to 24 points, while the Huskers managed just 14 points off Drake’s 17 miscues. The Bulldogs also outscored the Huskers 15-8 in second-chance points. Kissinger led the Big Red with eight first-quarter points while Brown added six points, as eight Huskers scored in the first quarter. Reigning Missouri Valley Conference Player-of-the-Year Becca Hittner opened the second quarter with nine straight points in the first two minutes to cut Nebraska’s lead to 32-24. Her second three-pointer in the spurt started a 16-0 Drake run that ended with five straight points from Bachrodt to give the Bulldogs a 37-32 lead with four minutes left in the first half. But Drake responded to make the plays down the stretch, including eight points from Maddy Dean in the final five minutes. Dean completed a double-double with 13 points and 10 rebounds to go along with four assists for the Bulldogs. 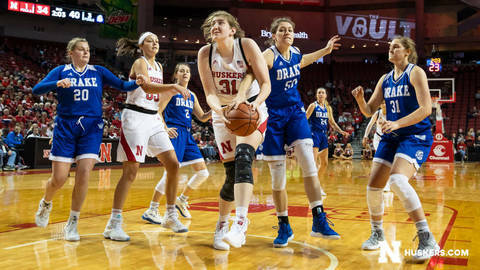 Sara Rhine, who did not play in last year’s game with Nebraska, added a double-double of her own with 11 points and 10 boards, including five of Drake’s 19 offensive rebounds on the night. Hittner finished with a game-high 19 points, while Bachrodt pitched in 15 points. Miller gave the Bulldogs five players in double figures with 11 points.